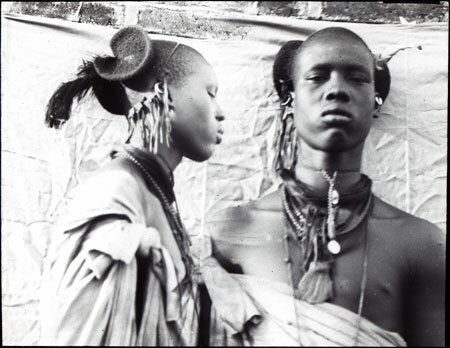 A physical anthropology composite image of the profile and full face of a Shilluk youth wearing numerous ornaments and with an elaborate coiffure. Manual catalogue entry (thermofax catalogue copy in folder '27-06 Seligman Slide Collection') - "V.b.28. Shilluk, ordinary type"
Note on lantern slide - "V.b.28. Sudan. Shilluk, ordinary type. CGS. 223 & 224"
Morton, Chris. "Portrait of a Shilluk youth" Southern Sudan Project (in development). 03 Jan. 2006. Pitt Rivers Museum. <http://southernsudan.prm.ox.ac.uk/details/1967.26.48/>.